Kelly Pawlick, owner of City Soup is a seriously busy lady! 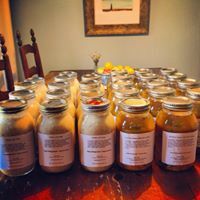 She whips up 120 quarts of organic, locally sourced soups and delivers the soups to over 60 homes each week! 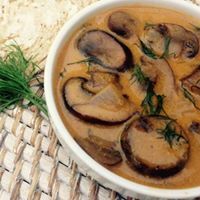 I've been a customer of City Soup for just about two years and always look forward to the Facebook post each Sunday which lists the upcoming week's menu. Kelly offers two soups on Tuesdays and two soups on Thursdays. The ingredients are all listed as well as building block recipe ideas. The process couldn't be more simple, you just add your name and selections in the comments section, message Kelly your address if you are a new customer, and set a cooler along with payment out on your front porch on the chosen day. Kelly delivers in the late afternoon to early evening. The soups arrive chilled, ready to heat and right in time for dinner. If requested, Kelly will place your soups in freezer ready bags. Nearly all Kelly's recipes are gluten free and all are vegetarian. The soups arrive in glass mason jars and you are asked to place your cleaned mason jars out the following week for pick up, as Kelly will recycle the jars. During the summer months City Soup will offer chilled soups and salads. Many of the vegetables and fruits used in the soups are sourced from Blenheim Organic Gardens and Snead's Farm. There's nothing better then having your doorbell ring with homemade soup on a chilly winter evening (or on a random 73 degree Virginia winter evening).